Bald characters, emotive smiley faces and a foot were among the most talked about emoji to arrive in Apple's most recent iOS 12.1 software update, according to a report on Thursday. An informal study conducted by emoji resource Emojipedia revealed "Woman/Man: Bald" was the most discussed character included in iOS 12.1, which saw release on Oct. 30. The latest software update brings more than 70 new emoji to communications apps like Messages. Second and third place went to "Woozy Face" and "Smiling Face With 3 Hearts," respectively, while a foot came in fourth. Notably, four of six new smileys ranked in the top ten, as did three hairstyles, a leg and a Mango. Cupcake followed Mango as the most discussed food item, while Llama led the animal category. Bringing up the rear were everyday objects including a magnet, safety pin, broom, and in dead last, a basket. Emojipedia assembled the list of based on comments, likes and retweets in a Twitter thread dedicated to the new characters. The polling period lasted from Oct. 30 to Nov. 7. Though other operating systems rolled out support for the emoji prior to Apple, iOS typically drives widespread use of new characters thanks to its fast uptake by end users, Emojipedia said. As noted in a corresponding blog post, the bald face and other top emoji are likely seeing more play on Twitter thanks to their -- unintentional -- relation to existing memes. Bald Man and Bald Woman, for example, go well with "wig snatched," a term used when someone is blindsided by the airing of sensitive information. Apple's emoji are commonly viewed as the best artistic renderings of approved Unicode characters, with the latest glyphs covering version 11.0 of the standard. Looking ahead, the company said it is working with the Unicode Consortium to include more disability-themed emoji in next year's release. I’m awake, so I thought I’d save someone some time. 👩🏻‍🦲👨🏼‍🦲 Oh, is that what that is? Were the emojis discussed using emojis? Is that something our civilization have to pay attention? Do not we hove more important things to discuss? While I certainly won't begrudge anyone their version of "not harmful to others" fun and interests, it still amazes me that emojis are a thing of such magnitude that Apple can justify spending money on being the best at them. You should always remember the /s remember 50% of any given sample of humans has an IQ <100! Apple employs a load of emojis to do all this work, they keep them in a basement and pay them peanuts. The fact that Apple spends so much energy on emojis, worries me. You don’t understand how valuable emoji are for the customers. 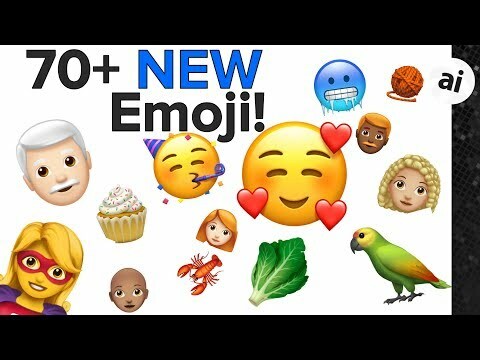 The release of new emoji is one of the biggest drivers for people to update to new iOS releases! That's such a low-bar... If that's what Apple has to offer to customers... Better they spend on features that add value - not just add-ons to same-old emojis & shapes & colors... I don't mind Emojis at all - just that Apple took most of their keynote last year spent on Animoji or Emojis... Hope (really hoping) iOS 13 has new UI and revamped OS - current one is stale & dated !!! Then I hope you never step outside your home and see real worry. Apple doesn’t invent emoji, the characters are added to the unicode character set by committee. Vendors must then implement them, or else their customers will see empty boxes when they receive one of the characters. Apple’s graphic designers aren’t going to be doing other things that hold up hardware or software releases, so no idea what you’re on about. Nah, it isn’t stale nor dated. You’re just bored, and incorrectly looking for entertainment and personal fulfillment from your tools. Very odd.